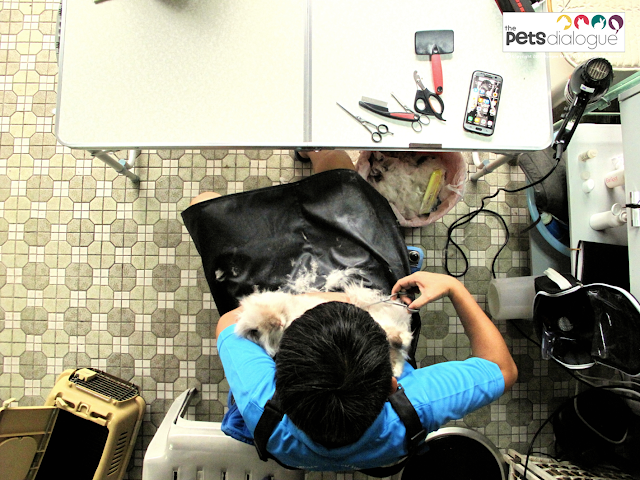 Pet ownership doesn’t just entail providing a safe home, food and healthcare, pet owners are constantly trying to seek out the best suited groomer for their beloved pets, but what kind of service are you getting exactly? The golden question of TRUST is often a hit AND miss, or trial and error for most pet owners, even after going through countless Facebook reviews. 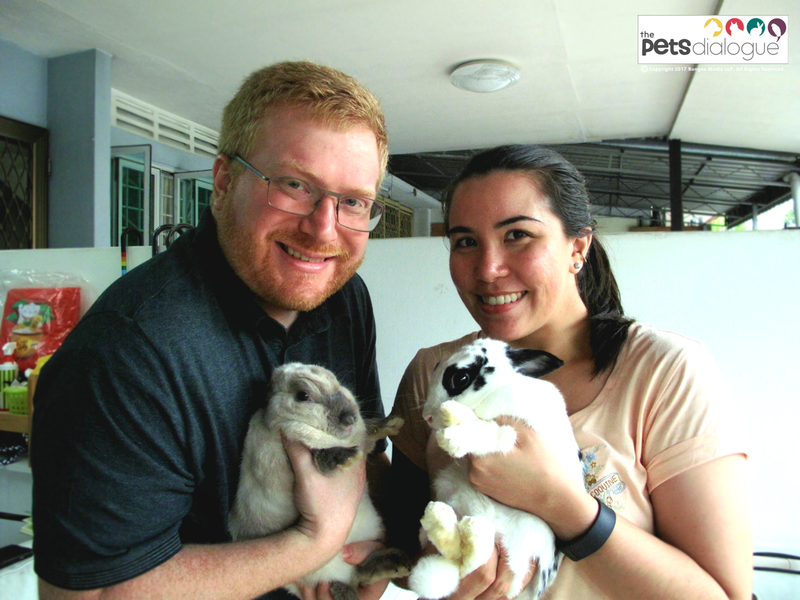 We decided to spend 2 days with Angie’s Pets, for first class seats in experiencing the service provided by a popular mobile Rabbit groomer, as featured on The Straits Times in 2013. If you are a Rabbit Owner, we’re pretty sure you’ve heard of Angie the Rabbit groomer, if you haven’t, then you ought to read on about this lady with 8 years of experience in the industry. 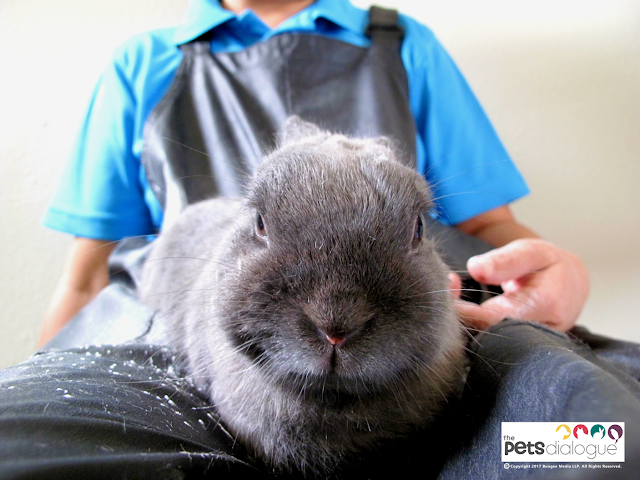 This is a straight up interview and behind-the-scenes look into the Rabbit grooming service she provides at your doorstep! Affirmation of quality from a pet groomer like Angie doesn’t come with a fancy storefront or flashy equipment, but you can be rest assured of her knowledge and skills, at years of practicing this craft. 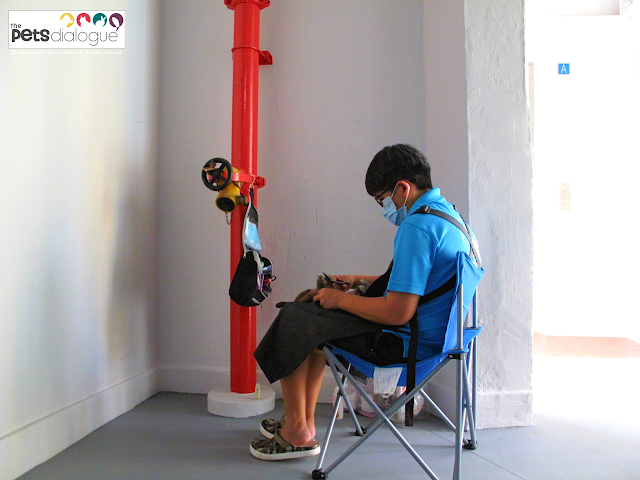 We were treated to an educational experience with every client visit. What Does Angie’s Pets Specialise In? "Consultation Table" Grooming while owners watch on. 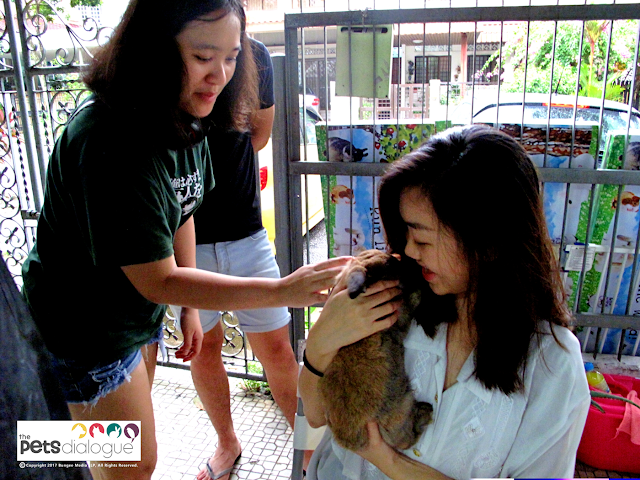 Indeed, for our first encounter with Angie was at Nee Soon Pets Fiesta, where Angie herself conducted talks and live demonstrations. Rabbits aren’t tough to handle, but they are pretty fragile. Most importantly, her educational efforts at events as such are for boosting awareness amongst the public, on Pet responsibilities and proper Rabbit handling. It isn’t all fun and smiles for this particular Rabbit Groomer, with that much attachment and love she has for Bunnies, comes great heartbreaks (and annoyance) when she has to face Rabbits in terrible conditions. If you know you haven’t been a very hardworking or responsible owner to your Bun or Cavy, be prepared for a round of productive nagging. We’d admit that Angie’s straight-forwardness may seem off-putting at first, but our thoughts stand corrected upon learning that some Rabbits have bad toilet habits, i.e. stepping/resting in their own urine and waste. Even though Rabbits are known to be fastidious at self-grooming, this is a common behaviour that is tough to “alter”. These Buns need a lot of extra attention, (urine burns/infections are no joke). Untended Buns suffer from sores and horrible balding patches. 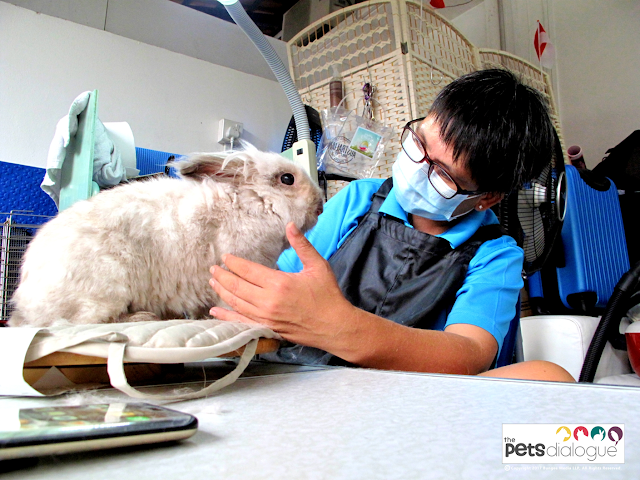 Since there were no glass panels, these grooming sessions were always at close proximity, issues pertaining to the Rabbit(s) can be pointed out immediately, bridging communication from the pet, to owner(s), and Angie herself. 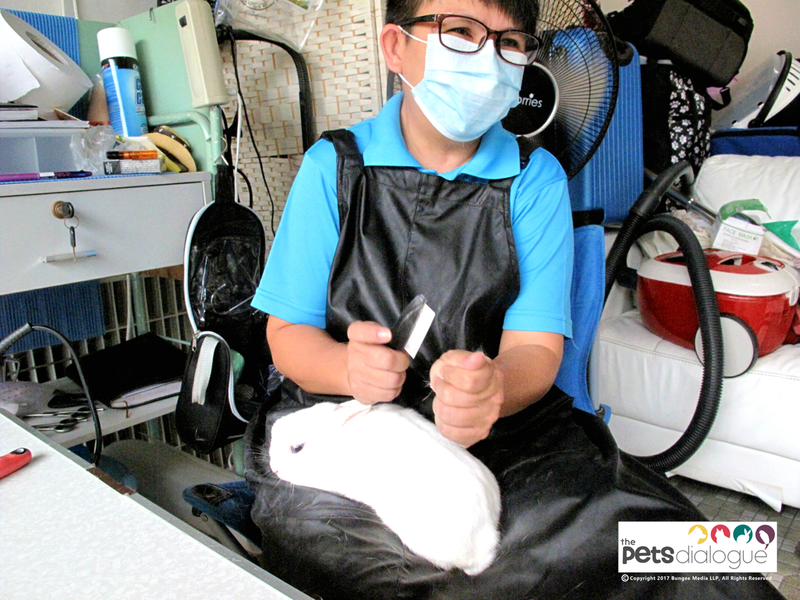 Let’s be frank here, pure concern is a trait you don’t find in every groomer, and we were thoroughly pleased and touched by this Rabbit groomer. 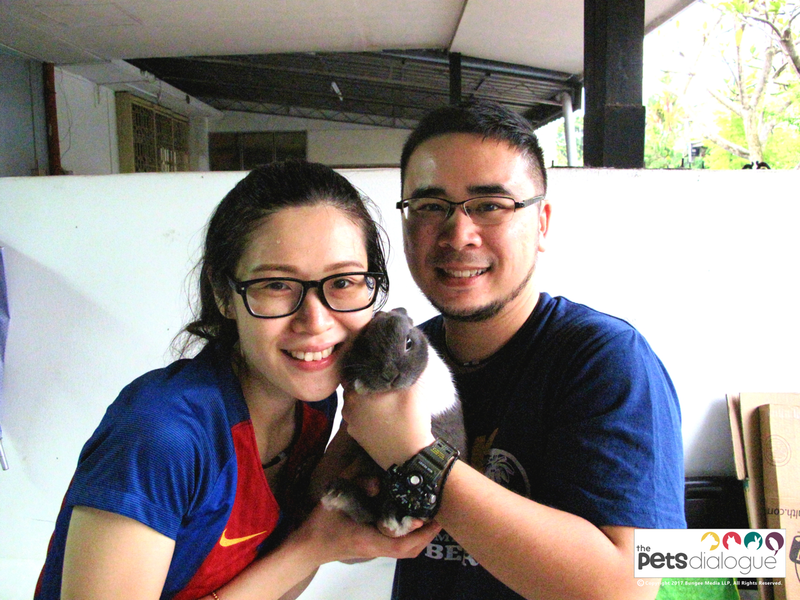 Aside from the serious matters, you can expect a good laugh and chit chat with her while she is giving your Rabbit(s) a little grooming therapy. So What Equates To A Good Grooming Experience? 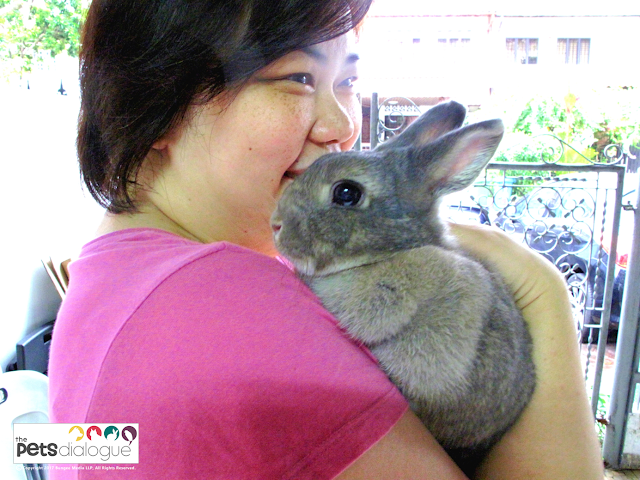 – Angie replied, while grooming Habibi, one of Angie’s regular Buns. Let’s not forget how happy and relaxed these Buns always look after grooming, they were either calmly nestled in her lap, or being the happy explorers that they are. If you thought Cesar Milan was cool, Angie’s the Rabbit Whisperer. Charcoal, in Zen mode right after grooming. YunYong, and his very doting Pawrents Mia & Sim. 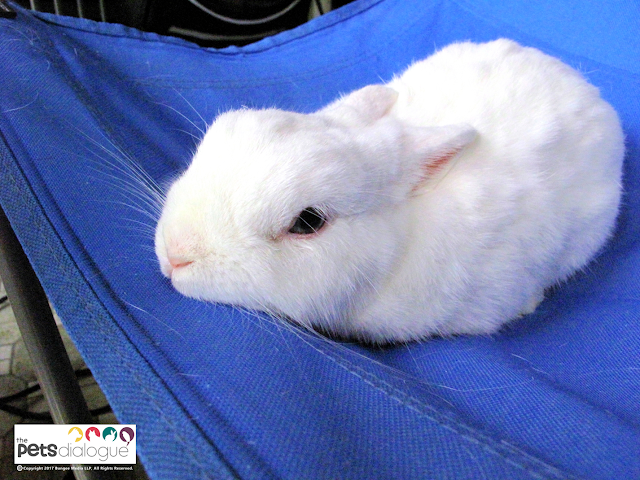 Putting a bunny in trance often looks like they are relaxed, because they are laid down on their backs, usually with eyes closed. 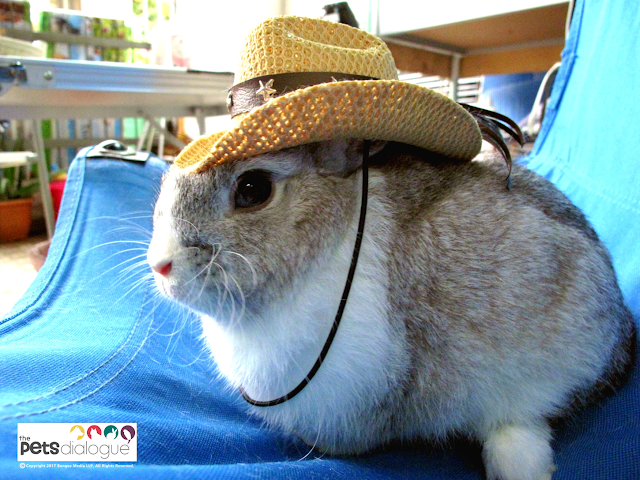 Most Rabbit owners are against “trancing”, only because a Rabbit trance is a defence mechanism induced by fear, and fear = stress. Don’t forget, Rabbits are preys in the wild. Angie supporting a Bun's back with her raised thigh. Okay, calm your horses! Yes they are, supported by Angie’s lap, just for a swift nail clipping, and if you look close enough, you’d notice their eyes are not fully shut. Some of the fidgety Buns were able to flip upright again! What Did The Customers Have To Say? These customers were a variation of regulars and also first-timers, a perfect mix to get an accurate overall review. Yee-Haw! Doesn't Casper look smashing? 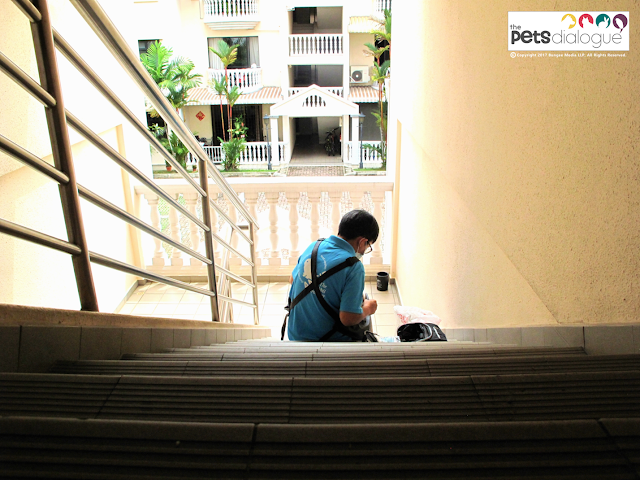 Did you know that Rabbits are one of the most commonly abandoned pets in Singapore? That has also affected the “quality” of adopters or potential Bunny parents, Shelters and Rescue groups have it tough getting an honest gauge of Rabbit knowledge from these folks, but Angie believes there’s still hope. Mama Angie's gonna hold your head ; Rorschach getting a little brush on! We can frankly say that her personality brings out openness and honesty in people, so customers aren’t afraid of asking or admitting to their lack of knowledge, in which Angie’s only too glad to help by giving her two cents on matters. We Asked Them: Why Angie’s Pets Out Of All? Olivia & Kira ; Kira used to be severely thin, before Olivia rescued her! Cookie, a recently adopted Bun ; finally allowing owners a long awaited hug. What Does Angie’s Pets Aim To Achieve In Future? This was a fairly logical question, anyone with this much love and passion for what they do have definite goals, ridiculous sounding or not. And we asked Angie just that. 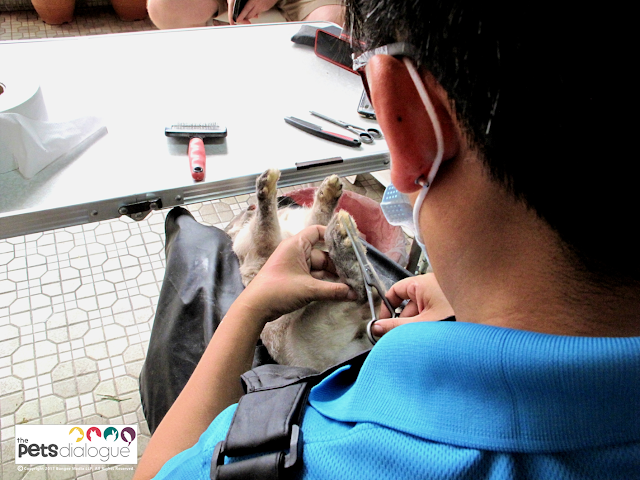 While Mobile pet grooming is picking up rapidly in other countries with an extremely receiving crowd, it’s a little different here in Singapore, and unrealistically speaking? Angie has always dreamed of having a van entirely decked out with grooming tools, table and chilling corner for bunnies and owners. To that, we couldn’t help but smile, why, isn't that an adorable dream!? Blunt people can turn out to be the most caring ones, don’t you agree? The 2 days we’ve spent with Angie’s Pets wasn’t glamorous or fancy, it was a lot of sweat and long hours. 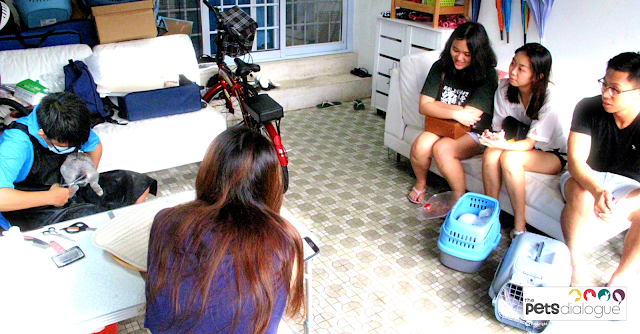 Whilst snapping photographs, we couldn’t help getting hit by a tinge of loneliness (whenever owners weren't there to watch and chat) as Angie sat at various locations, snipping and brushing a Bunny. But her dedication and passion made our tag-a-long a lot more satisfying, as opposed to feeling the immense fatigue. How are you today Bun? I'll be quick on the nails, promise. "It's not about my comfort, it has to be comfortable for the Rabbit, I'm alright sitting in an awkward angle, as long as they are relaxed"
A hairdresser asks if you’re happy with your haircut after every session, yes? 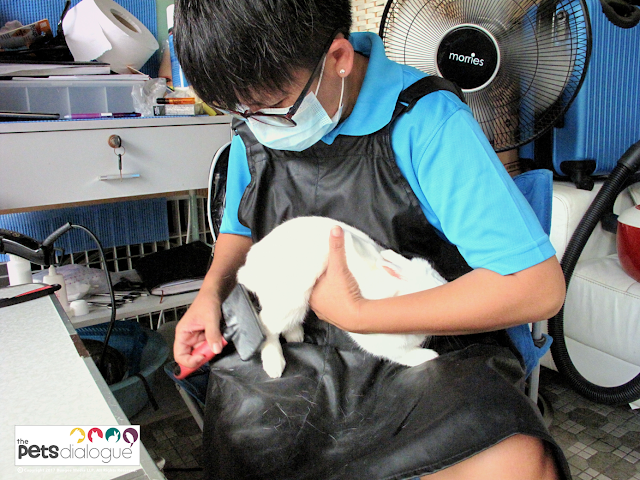 Well Angie does the same for your Rabbits, making sure you are okay with your Bun’s cleanup. Not only that, she explains what she has done, and teaches you how you can maintain it. All groomed and relaxing. One Zen Bun done, more to go! What Foods Can I Feed My Rabbit? Do YOU have a story to share? Your voices are important to us and the Pets community! Our readers are encouraged to share their Pet-related reviews of a place and its services, experiences, even lifestyle tips and tricks to better our Pets lives, on our platform, one paw at a time. Be a part of an educational and informative Pets community because at ThePetsDialogue, your voices could make a huge difference on a global scale.